We measured and tried on a number of sizes in this jacket and found them to fit as expected. I’d encourage you to order the size you normally wear in men’s clothing for sizes Small through XL, and since there is limited standardization on fit above XL, I’d recommend those who wear larger sizes to measure their chest and belly and choose based on the chart I’ve put together below. If you find yourself between sizes, I’d encourage you to order the smaller. Those with large bellies will love this style. The proportions are generous through the lower torso… for each size, the belly is about 2” smaller than the chest, but on each side of the jacket are expansion zippers that go way up, almost to the armpit and when open will another 4” or so to the max belly! But also, there are side waist adjustment straps to snug down the mid-torso area for those with slimmer lines. VERY versatile! Here is a chart we put together with approximate max chest and belly sizes for every “alpha” size. You can use this chart to choose a size based upon your chest and belly measurements. Note: This chart mirrors Fly’s official size chart for sizes XL and above, but shows larger sizes than Fly’s chart for smaller sizes. Their chart for the smaller sizes is not accurate. The Fly Racing jacket Flux Air jacket is made for those who need a jacket the absolute best airflow possible. this jacket is a FULL mesh design, meaning there are no textile reinforcements, etc to impeded the full flow of air, so this model will perform the best of nearly any mesh jacket we sell. The lack of solid textile overlays, etc does have a downside… those reinforcements are to add some abrasion resistance and to provide some structure to the jacket to help hold the armor in place if/when you fall. But often get request from riders who want a “minimalist” jacket like this as something they can tolerate to wear in their extreme heat climate, so for those folks, this one will serve the purpose. 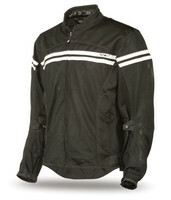 This jacket does include a separate rain barrier for use when it rains. Or you can install the liner and it will function as a wind break for cool mornings, mountain passes, etc. The liner is VERY thin and comes in a little storage pouch you can throw in a piece of luggage or storage compartment when not needed. The liner admittedly is very thin and probably won’t hold up to frequent use and handling, but for occasional use I think you’ll find it works well. Add an upgraded back protector? : This jacket comes with a simple foam back pad and Fly doesn’t offer a CE rated upgrade, but I find that our most popular upgrade back protector by D3O fits the mesh pocket in this style very well. The men’s size Back pad in either Level 1 or 2 fits both men’s and women’s (the women’s size back pad is too small for the women’s jacket pocket, so get the men’s there too). You could get level 2, but for a general duty jacket like this, I think the Level 1 upgrade will be most comfortable and practical.